Los Angeles Dodgers' left-hander Ryu Hyun-jin has recovered from norovirus and will make his spring debut this week, the team announced Monday. 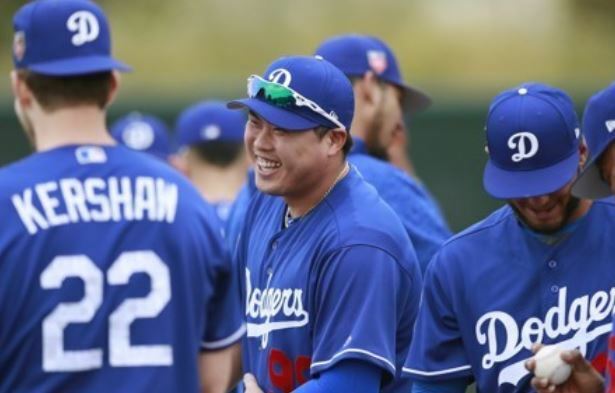 The South Korean pitcher was scratched from his scheduled start last Wednesday (local time) in Arizona while dealing with the norovirus, which is known to cause stomach pain and diarrhea and worked its way through the Dodgers' spring training clubhouse. A report on MLB.com said Ryu is now healthy enough to pitch in the unofficial "B" game against the Chicago White Sox's minor leaguers on Monday, local time. Ryu Hyun-jin of the Los Angeles Dodgers (C) smiles before a workout at the club`s spring training site in Glendale, Arizona on Feb. 14. (AP-Yonhap). Ryu, who got married in Seoul in early January, departed for the United States on Jan. 25, and began pitching in early February. He had been scheduled to face the San Diego Padres last week for a couple of innings before the virus sidelined him. Ryu, who will turn 31 later this month, will be entering his second full season after left shoulder surgery that wiped out his entire 2015 season and limited him to one start the following year. In 2017, Ryu went 5-9 with a 3.77 ERA in 25 appearances, including one out of the bullpen. Despite a solid second half, Ryu was left off the Dodgers' postseason roster as they lost to the Houston Astros in seven games in the World Series. Ryu is a safe bet to be back in the starting rotation for the regular season, behind Clayton Kershaw, Rich Hill, Alex Wood and Kenta Maeda.